At the very outset, I would like to thank Dr. Siddharth Shah and Dr. Venkat S Ram and the executive committee of the Hypertension Society of India for giving me this opportunity because I learned quite a lot in the last 2 days about hypertension. There is an increase in the epidemic of chronic kidney disease all over the world including the developing world because of the increased incidence of obesity, diabesity, and hypertension. Hypertension is a very important factor not only in general population, but in chronic kidney disease because it makes a progression of the kidney disease from stage I to stage IV or ESRD and also contributes to cardiovascular morbidity and mortality and hence it is a very important topic. CKD denotes any renal abnormality persistent for more than 3 months with or without renal failure or an eGFR by Cockcroft Gault formula less than 60 mL/minute more than 3 months, if you are not able to do 24 hour collection of urine protein and creatinine clearance. There are 5 stages of CKD. When you do a creatinine clearance and you find if it is below 120-90, it is stage I; 60-89, stage II; 30-59, stage III; and 15-29 stage IV. Till that stage there are not much of symptoms, only in stage IV you get these uremic symptoms. Hence, it is very important in higher risk cases like diabetes, hypertensive, and also with family history of chronic kidney disease or in elderly, you have to do a serum creatinine and creatinine clearance. One in ten individuals walking in the world has got a creatinine more than 1.5 mg. Actually if you see the incidence of hypertension in the dialysis patient it is about 90%. Actually it increases from stage I CKD to stage IV CKD from 40% to 90%. Hypertension is a modifiable risk factor in the progression of CKD. There are many factors, dysglycemia, dyslipidemia, anemia, hyperhomocysteinemia, etc., but then hypertension is a very important factor because it makes progression of chronic kidney disease if you do not control the blood pressure properly with appropriate drugs. Well you need to look at the adjusted relative risk, you find, more the hypertension, more the progression. For example, even if it is 110/119, the progression of kidney disease is much less. Hypertension also causes cardiovascular disease in CKD. There are many factors, which cause cardiovascular disease in CKD like dyslipidemia, dysglycemia, smoking, and physical inactivity because CKD is a potent cardiac manifestation. Like diabetes you say it is potent cardiac problem, CKD is a potent cardiac problem. 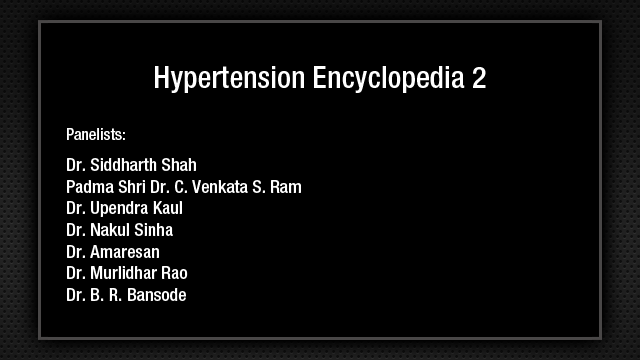 Hypertension is the one which worsens the cardiovascular morbidity and mortality. Look at this, as the GFR decreases, the progression in chronic kidney disease, there is a progression in cardiovascular morbidity. Most of the cases of CKD do not die of renal failure; they die of cardiovascular morbidity and mortality, either as cerebrovascular disease or cardiovascular disease or due to infection. The kidney and hypertension are like, whether the chicken has come first or the egg has come first. There is an intimate relationship. When you do not look after the hypertension it causes chronic kidney disease. Most of the chronic disease, I already alluded that there is hypertension. If you do not look after both, there is progressive renal damage and there is ESRD, which leads to cardiovascular morbidity and mortality. Look at this slide, it came in Kidney International, the so called pathophysiology of the primary hypertension itself you find decreased excretion of sodium and water and also increased renin-angiotensin aldosterone axis plays a very important role besides the nephron number in a child born with low birth weight and other heterogeneous things are also important in primary hypertension. When I was practicing in 70s and 80s, the glomerulonephritis and vasculitic were the commonest causes of chronic kidney disease. Today, when I dialyze 100 patients I find 60% of them are diabetic and about 20%-30% of them are hypertensive. So, about 80%-83% are diabetic and hypertensive. All the diabetics are also hypertensives, so you find that the diabetes and hypertension form the major culprit in cases. This is what I find in my own practical experience. Hypertension in diabetic kidney disease: A 40%-50% of our type 2 diabetics have already got hypertension and 20% -40% with impaired glucose tolerance have hypertension. Diabetes and hypertension increases the CV risk 3 folds. 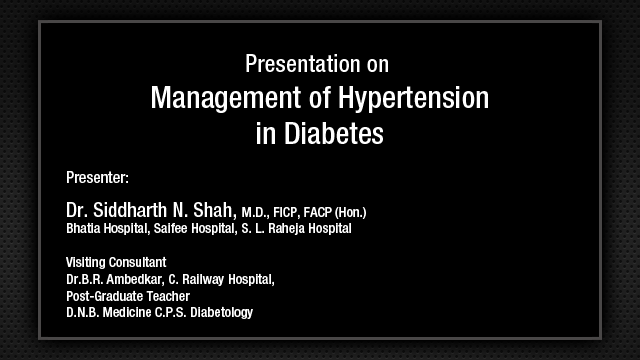 65% of type 2 diabetics have systolic hypertension. Systolic hypertension is a strong predictor of cardiovascular events. One of the common causes of resistant hypertension when you use 3 drugs including a diuretic you call it resistant hypertension wherein the blood pressure does not go down. If you look at the pathophysiology, it will be exactly like the pathophysiology of primary hypertension. One is the volume dependent; the other is the renin-angiotensin aldosterone axis. These are the 2 main things, but their result increase sympathetic nervous overactivity. Also there is a severe reactive oxygen stress-giving rise to endothelial dysfunction. Also, there is inflammation. Actually, there were 3 topics in the World Congress in Vancouver on inflammation in the kidney causing chronic kidney disease and hypertension and also the inhibition of sodium-potassium ATPase is due to endogenous digitalis like factor. PTH increases from the very beginning of decline in the GFR and the PTH produces increased calcium into the vascular wall and that is also one of the causes for hypertension in CKD. Angiotensin II is a villain in hypertension and CKD. Whether it is a diabetic disease or it is hypertension or primary renal disease, you find there is hyperfiltration leading to increased single-nephron GFR, mechanical stress leading to increase amount of angiotensin II. Angiotensin II not only produces aldosterone and completes the renin angiotensin aldosterone axis, but also increases the cytokines and chemokines and also converts the monocytes into macrophages. It produces endothelial, mesangial, and podocyte injury giving rise to focal segmental glomerulosclerosis as well as diffuse glomerulosclerosis and tubular interstitial fibrosis. One other important factor is asymmetrical dimethylarginine. In a chronic kidney disease because of the uremic toxins and dyslipidemia and diabetes and smoking there is increased accumulation of asymmetrical dimethylarginine and that leads to not only hypertension, but also increases the endothelial dysfunction which is already there and also increases the proteinuria and also contributes to the cardiovascular morbidity and mortality. Why I am mentioning it is ACE or ARB reduces the ADMA level also besides correcting the endothelial dysfunction. Look at Bakris analysis. The lower the blood pressure, slower is the decline of the renal function. So, you can prevent and from stage IV you can bring it to stage III, and if it is in stage I you will not allow it to go into stage II. Well you talk about microalbuminuria always in Dr. Siddharth Shah's specialty, diabetes mellitus, but it is very important even in cases of hypertension. One of the international survey where 22,000 patients have been analyzed with and without CKD, they found 53% to 71% with microalbuminuria. Microalbuminuria is a reliable indicator for endothelial dysfunction. LIFE study has shown that there is 51% increase in the patients without diabetes mellitus, an hazard ratio for stroke if there is a increase in urine albumin-creatinine ratio. Annual screening of microalbuminuria and hypertension also is very important. That is why ACEI and ARB plays a very important role even in the pathogenesis of hypertension and CKD and also in the primary hypertension. Proteinuria is not just a marker of the kidney injury. It does produce progression of the kidney injury, but then kidney is a window to the entire vasculature and so what happens is microalbuminuria itself is kidney's message on the microvasculature showing diffuse endothelial dysfunction. This leads to cardiovascular morbidity and mortality even in the microalbuminuria stage. The more the amount of albuminuria, more the incidence of cardiovascular morbidity. If there is reduction in the kidney function, the morbidity is much more. The targeted control in the KDOQI guidelines is, if there is CKD with hypertension, it should be less than 130/80. I am happy that the Indian guideline also says the same thing, but if there is a massive proteinuria, more than 1 g, it should be reduced to 125/75. Only place where you have worry is an elderly person, you reduce the blood pressure below 120, I think, he may develop a cerebrovascular disease. The MDRD Study: If the mean arterial pressure is 92 mmHg, unless you delay the progression of kidney disease by several years and the ESRD also will be delayed by several years. Blocking the renin-angiotensin aldosterone axis by ACE and ARB is the current gold standard in therapy of CKD hypertension worldwide because the angiotensin II constrict the afferent and the efferent arterioles, but the efferent arteriole constriction is much more than the afferent given rise to glomerular hypertension and also there is destruction of the mesangial endothelial cells. What happens if you give a monotherapy of calcium channel blockers, it dilates both the vessels and increases the glomerular hypertension and you find it is not that, it is a very pleiotropic drug. Anticytokine, anti-inflammatory, reverses the endothelial dysfunction, increases the insulin sensitivity, filtration of protein across the glomerular capillary wall is reduced, normalize nephrin gene expression, restores glomerular basement pore size besides the other actions. So, I think ACE and ARB or pleiotropic drug should be first drug of choices to treat the hypertension, particularly in CKD. How do you block the renin-angiotensin system? You can block it at the ACEI level. ACEI is the best drug in CKD because it not only reduces the blood pressure, but increases the bradykinin, which is vascular and cardiac protector. Maybe, it may produce a side effect in 20% of the people, but then it only blocks the 60% of the angiotensin 2 but 40% comes through alternate pathways, by chymase and cathepsin and so ARB will be better to have a complete blockage, particularly if they are ACE intolerant. Both if they are given for 1 or 2 months, there is not only aldosterone escape, but there is also renin escape. The best one will be the direct renin inhibitor. Twenty years later we have got a direct renin inhibitor in the name of aliskiren, which will block the angiotensinogen and convert it into angiotensin 1. Actually, direct renin inhibitors are almost very similar to ACE and ARB in reducing proteinuria and also in organ protection. Look at the evidence base study: Captopril study, European Microalbuminuria Captopril Study, Micro Hope Trial, Bergamo Nephrology, all reduce not only hypertension, but also doubling of serum creatinine from 24% to 75% a progress to nephropathy has been reduced. What about the angiotensin receptor blocker, both in diabetic and non-diabetic? The landmark studies; RENAAL, IDNT Trial, IRMA Trial and the combination of COOPERATE Trial etc., and also LIFE Trial have shown that the ARBs reduce the doubling of serum creatinine, ESRD, and also prevention of diabetic nephropathy and also cardiovascular morbidity and mortality. The stroke has been reduced in LIFE Trial. What about improvement of cardiovascular outcome? HOPE Trial using ramipril has improved the cardiovascular outcome. IDNT, irbesartan; ADVANCE, perindopril; PEACE, trandolopril, ACEI/ARB not only prevent progression of CKD but also reduced cardiovascular mortality..
How do you optimize the RAAS? You can use a combination of ARB with DRI or ARB with mineralocorticoid receptor blockers like Aldactone or eplerenone or you can potentiate the action by using a combination of diuretic. The combination has been well discussed yesterday by Dr. Hiremath or you can give higher dose of ACEI like ramipril 40 mg, perindopril 24 mg, telmisartan 240 mg, irbesartan 900 mg, I think that is another way. Use of diuretic potentiate not only the reduction of blood pressure, also reduces the proteinuria produced by ACEI and ARB. The combination of ACEI and ARB is a controversial point. It does reduce the blood pressure much more and also proteinuria much more, but then does it give rise to organ protection. There are no randomized control trials, but I took Doulton et al metaanalysis of 8 trials, it finds usefulness in reducing proteinuria and the blood pressure much higher than the monotherapy. Well if ACEI and ARB does not reduce the blood pressure, adding eplerenone produces reduction in the blood pressure. Not only the aldosterone antagonist reduce the blood pressure, but reduces the proteinuria, reduces the apoptosis, reduces the fibrosis of the renal cell as well the myocardial cells that is why Ephesus Study using eplerenone, RAAS Study using Aldactone have found there is a reduction in the cardiovascular morbidity and mortality and reduction in the hospitalization. DRI 300 mg results of ALOFT, AVOID, ALTITUDE, and ALLAY studies suggest that aliskiren has positive effects of markers of cardiovascular and renal damage in patients with type 2 diabetes and nephropathy. Both congestive heart failure and left ventricular hypertrophy is reduced. Well, you already know about this particular slide that you have to use at least 3 drugs to have the target of 130/80. It is not only the ACEI and ARB; you have to combine more drugs. I would like to say that add-on drug like bisoprolol or nebivolol, I would prefer carvedilol or nebivolol, or according to the comorbidity that exists in the CKD. In severe hypertension, you can also add long-acting calcium channel blockers or clonidine or in a resistant hypertension, aldosterone antagonist may reduce the blood pressure. If aldosterone antagonist does not reduce the blood pressure, you can use clonidine or minoxidil. Why do I prefer carvidelol or nebivolol compared to other drugs because carvidelol is alpha-beta blocker? It produces a severe vasodilatation, powerful antioxidant, anti-inflammatory, increase in the insulin sensitivity, reduces proteinuria, inhibits apoptosis, improves lipid profile. I am not saying that Comet Study and Gemini Study say that and nebivolol is almost very similar except that there may be a slight increase in glucose and reduction in HDL, it is very minimal. If I want to use a calcium channel blocker today, I would like to use fourth generation calcium channel blocker, cilnidipine because it not only blocks the L-channel of the calcium channel producing vasodilatation, but it also blocks the N-channel. You find that there is reduction in sympathetic surge and also there is increased renal blood flow and also reduced amount of renin secretion and hence it almost acts like an ACEI. What about hypertension in ESRD when the patient is on dialysis? Nonpharmacological Methods by which that you reduce the volume overload, reduce it to dry weight and also exercise itself will bring down the blood pressure to normal. But those with severe hypertensive with CKD the antihypertensive dose come down if you bring the dry weight in case of dialysis patient. Even in CKD, ESRD the first drug of choice is ACEI and ARB because it reduces the mortality and morbidity, preserves residual renal function, preserves vascular access and also peritoneal membrane function, particularly in cases of peritoneal dialysis patient. Use of beta blockers may be necessary if there is a comorbid condition and I would prefer non-dihydropyridine calcium channel blockers, particularly, verapamil and diltiazem which can reduce not only the blood pressure, reduce the proteinuria. But you got to be careful with intradialytic hypotension, so you got to train the patient and have a home record of the blood pressure. Home record of blood pressure will be much beneficial and orthostatic hypotension is quite common in dialysis patient and so standing blood pressure checkup is very very important after the dialysis is over. What about the CKD-T, i.e., posttransplant hypertension. Usually it is due to the presence of native kidney or addition of cyclosporine and cortiscosteroids. The other causes are very rare. I think for that I use calcium channel blockers. It is better to use nondihydropyridine, but you can use dihydropyridine calcium channel blockers because it reduces the renal artery resistance produced by the cyclosporin and so it combats the cyclosporin toxicity on the kidney and of course if the BP is not controlled we can use beta-1 blockers, not atenolol, but then you add ACEI and ARB several months after the posttransplant followup about 6 months or 1 year later because if it suddenly raises the serum creatinine, you do not know whether it is due to acute rejection or it is due to ACEI and ARB. The lifestyle modification: Weight reduction by 5 kg reduction can reduce the blood pressure by 5 mmHg. DASH Diet Approach to Stop Hypertension, it is a very important thing, even in CKD patients. It can reduce the blood pressure by 8 mmHg to 14 mmHg. Sodium reduction to 2.4 g is a very important thing because it is an essential step in CKD. Physical activity is also very important. Moderation in alcohol and smoking is very very important thing and you have to ask the patient to stop smoking because smoking produces glomerulosclerosis, tubular interstitial fibrosis, renal atherosclerosis and so it not only produces various other complications, it does effect the kidney directly. Salt and control of fluid intake is essential. The salt reduction and salt intake not only reduces the volume and reduces the blood pressure, but also potentiates the antiproteinuric effect of ACEI and ARB and nondihydropyridine calcium channel blocker. Diuretic therapy, particularly furosemide and torsemide, if the GFR is less than 30 mL/minute will improve the BP control and volume overload and also potentiate the antiproteinuric effect of ACEI and ARB. Restrict fluid; do not put fluid in CKD. Exercise training is very important even in dialysis patient. Exercise is beneficial irrespective of the stage of CKD and treatment modality. It increases the maximal exercise capacity, functional capacity, improves cardiac function, improves blood pressure control, improves insulin sensitivity and improves survival. There is a review of exercise on cytokines. Actually, it is anti-inflammatory. There are about 20 advantages of exercise. I hope the doctors are doing exercise regularly. Statin is a wonderful drug. Not only it reduces the LDL cholesterol, but it reduces proteinuria. It reduces the blood pressure. Why does it do, because it is a pleiotropic Drug. It is antiproliferative, antiapoptotic, antifibrotic, improves hemodynamics, antioxidative, stem cell activating effect, improves endothelial dysfunction which exists in diabetes as well as hypertension, which are important causes of CKD. Comprehensive Strategy to Renal Protection. Specific renoprotective therapy, i.e, treating the underlying renal disease, SLE or polyarteritis or glomerular disease. Immunosuppressive therapy and produce remission or at least prevent the progression. ACEI and ARB to reduce the proteinuria less than at least 0.5 g is very important. It will help in stopping the decline in the GFR. What about the cardiorenal protection? Well additional, antihypertensive therapy to reduce the BP below 130/80. Lipid lower therapy, LDL cholesterol should be reduced to less than 100, but in comorbidities it should be reduced below 70 mg/dL and tight glycemic control, not by fasting and postprandial. Hemoglobin A1c less than 6.5. Correction of anemia with erythropoetin and IV iron sucrose to keep the hemoglobin at 12 g is a very important step. Smoking cessation, I already alluded to is a very important thing. STENO trial by Parving is a landmark trial about the multifactorial treatment. If you have controlled the dysglycemia, dyslipidemia and used ACEI and statin you will find nephropathy is reduced by 61%, autonomic neuropathy reduced by 63%, retinopathy reduced by 58%, and CVD reduced by 53%. I have put this slide not to show about renal denervation, but want to tell you that there are a lot of afferent and efferent sympathetic nerves in the kidney. When there is an injury to the kidney, it sends impulse up to the hypothalamus. From there, there is a surge of sympathetic nervous system. So, in CKD there is not only renin-angiotensin system and endothelial dysfunction, there is a sympathetic surge and so denervation of the nerves may help you, but then those people who are talking about nonpharmacological will cover it in greater detail. Hypertension is common in CKD with increasing prevalence with its progression. Target control of BP below 130/80 is essential to reduce the cardiovascular disease and retard progression of CKD to ESRD, which throws enormous burden not only on the family, but also on the state. Proteinuria signals diffuse endothelial dysfunction and is a sinister marker of increased cardiovascular disease, morbidity, and progressive renal damage. ACEI and ARB should be the drug of choice even in later stages of CKD to block renin-angiotensin aldosterone axis and for its antiproteinuric, anti-inflammatory and cardioprotective effects. Add-on antihypertensives of choice include beta-1 blockers, not atenolol, but beta-1 blockers like nebivolol, carvedilol, and nondihydropyridine, CCB and cilnidipine. Lifestyle modification remains a cornerstone of management. Polypill therapy is a must in CKD. Statins, aspirin, antioxidants are important adjuvants to reduce the cardiovascular and cerebrovascular morbidity. Dr. Satyavan Sharma: Excellent talk. I want to raise a very important point and that is about the combination of ARB and ACE inhibitors. To our mind actually this is extremely, if I not use the word dangerous, a very problematic combination and in fact if we look at the data of ONTARGET trial in which an ACE inhibitor was combined with an ARB, even the renal endpoints, the renal outcome, hyperkalemia on the patients requiring dialysis was much more. So, this combination although reduces proteinuria, but this combination does not improve the outcome. Your comments on that. Dr. Amaresan: I agree with you, because that is why I said that Doulton's metaanalysis trial, that is the one which shows reduction in the blood pressure as well as reduction in proteinuria, but then organ protection, I would hesitate to use it in stage IV and stage V, the combination of ACEI and ARB, but particularly when you are checking once a month urea and creatinine, you can always check the potassium and you can find particularly when there is a hyperkalemia, you can withdraw the whole thing. I do use in stage I, stage II, and stage III a combination and I find reduction in the proteinuria is much more. Dr. Satyavan Sharma: Actually, you know proteinuria is used by our renal colleagues; actually speaking it is a surrogate marker. None of the trails have really shown by using this combination and by reducing proteinuria you are improving the outcome. Dr. Venkat your comment on this. Dr. C Venkata S Ram: As Dr. Amaresan has said that in so called uncomplicated hypertension, if there is such an entity, I am not sure, there is no benefit of using ACE plus ARB. In fact, as you mentioned, there is a disadvantage of azothemia and hypotension and occasional acute kidney injury. In small studies with type 2 diabetes, the combination has been shown to reduce proteinuria dramatically, but again no cardiovascular outcomes, proteinuria, additive effect. There is a study in kidney disease, non-diabetic kidney disease, IgA nephropathy, study called COOPERATE. In the COOPERATE, which is an IgA nephropathy with very profound proteinuria, the combination ACE plus ARB was better than either components in delaying the progression to ESRD in non-diabetic nephropathy and some surrogate cardiovascular points. So, there is some role for combination, but appears to be very small segment that has to be identified. Dr. Amaresan: Yes, I would completely agree with Dr. Venkat S Ram on that particular point. 1. In a renal chronic kidney disease hypertensive, it is very difficult to bring it down. The point is whether it does anything good between you know going below 130/80, and I am told that in JNC-VIII we are going to have that you should have blood pressure less than 140/90. Maybe up to 130, but not below 130, not below 80. Any comments on that. Dr. Amaresan: In ESRD patients on dialysis, 140/90 is the objective actually. I only talked about till the stage IV you got to reduce it to below 130/80, but in elderly person, I think you should be very careful, not to reduce the blood pressure below 120 systolic. 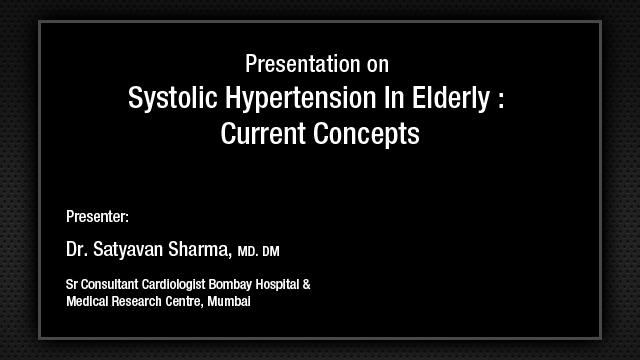 Dr. C Venkata S Ram: Just a comment, Dr., Upendra that is correct, I think the only problem we have to be very careful is, I always say that issue in hypertension is hypertension not hypotension. So, even if you have aggressive goals, either fortunately or unfortunately we do not reach them. So, I am not worried about dangers of aggressive blood pressure control. If you reach even recommended, I am more than happy, but you are correct under 130/80 either for CAD or CKD there is no incremental benefit, but there is potential of azothemia. Dr. Amaresan: 47% hypertensive and the dialysis patient do not control the blood pressure at all. That is a western statistics.